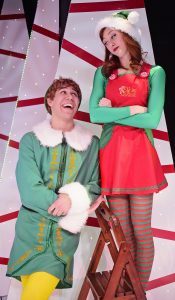 As its show-stopping production number, “Sparklejollytwinklejingley” suggests, “Elf, The Musical,” based on the 2003 Christmas fantasy, comedy film of the same name starring Will Ferrell, is indeed all that the song title suggests. Taking the place of Beef & Boards’ Christmas show, the production runs through Dec 31 at the venerable dinner theatre located on Indy’s far Northwestside. I saw it Saturday on media night. With music by Tony nominees Matthew Skar and Chad Beguelin and book by Tony winners Thomas Meehan and Bob Martin, the musical, more or less, follows the film’s storyline with some deviations. It’s a tale about Buddy, an orphan who ends up at the North Pole after crawling into Santa’s bag of gifts. Raised as an elf, he doesn’t know he is actually a human until the truth is revealed by another elf. After asking Santa’s permission, Buddy makes his way to New York City, where he is told his father lives. He is also informed that his father is on the naughty list and his half-brother doesn’t believe in Santa, so he makes it his cause to be accepted by his new family and share the true meaning of Christmas with them, but not before he innocently creates a lot of uproarious upheaval. Expertly directed by Doug Stark, who also plays a quintessential Santa Claus, the show stars Dan Bob Higgins as Buddy. With the role of Buddy emblazoned in the minds of many fans, including yours truly, who have seen Ferrell in the film version, some even multiple times, comparisons are inevitable. However, I am pleased to report that Higgins, who duplicates some elements of Ferrell’s characterization, does manage through the strength of his own persona, to place his own stamp on Buddy’s thoroughly likable character. Well-cast Higgins also captured Buddy’s vulnerability, naiveté and kindness quite adeptly. L-R Dan Bob Higgins & company – Courtesy o f Beef & Boards Dinner Theatre. Used with permission. The aforementioned “Sparklejollytwinklejingley” and the finale were highlights of the show, with a score, which is hardly memorable, but with its message of positivity about the importance of kindness, authenticity, taking risks and doing what you love, it’s guaranteed to soften the hardest of hearts. Finally, “Elf” is definitely a show for families. Proof of that was no more evident than the expressions of joy on the little boy who was seated with his mother at the table next to me. At intermission, I learned during a casual conversation with his mom that a year ago he had undergone multiple organ transplants at Riley Hospital for Children, but today is completely recovered and healthy. Watching and hearing the sweet young man’s delighted responses to the action on stage throughout the show was an added treat. But make no mistake, both young and old can capture the spirit of the holidays through Buddy’s innocent perspective, beautifully portrayed in “Elf.” The show’s a heart-warmer for all ages. 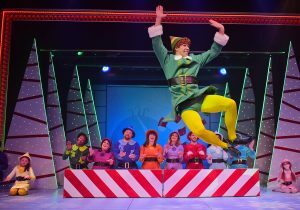 Tickets for “Elf” range from $44 to $69 and include dinner buffet, fruit and salad bar, and select beverages. Call the box office at (317) 872-9664 or go to beefandboards.com for tickets and information.